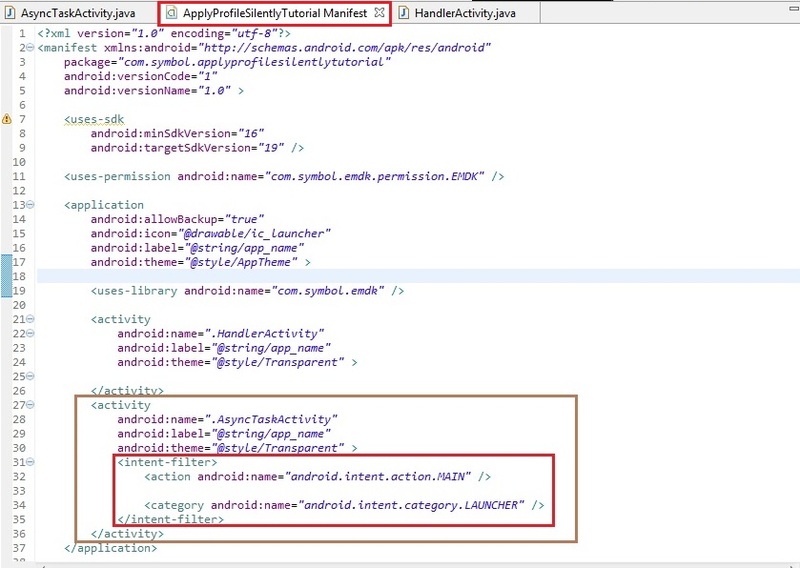 This guide will walk you through creating an EMDK For Android application that will use Mx features introduced in EMDK for Android API to perform device configurations. Mx represents a suite of Enterprise Features on top of standard, commercially available Android Open Source Project. In this tutorial we would discuss on how to apply Mx configurations to the device silently without displaying any User Interface in a non blocking way. The Mx features are used to perform device configurations through EMDK profiles as well as programmatically. When we are configuring any Mx feature through EMDK Profile wizard we may not require User Interface. 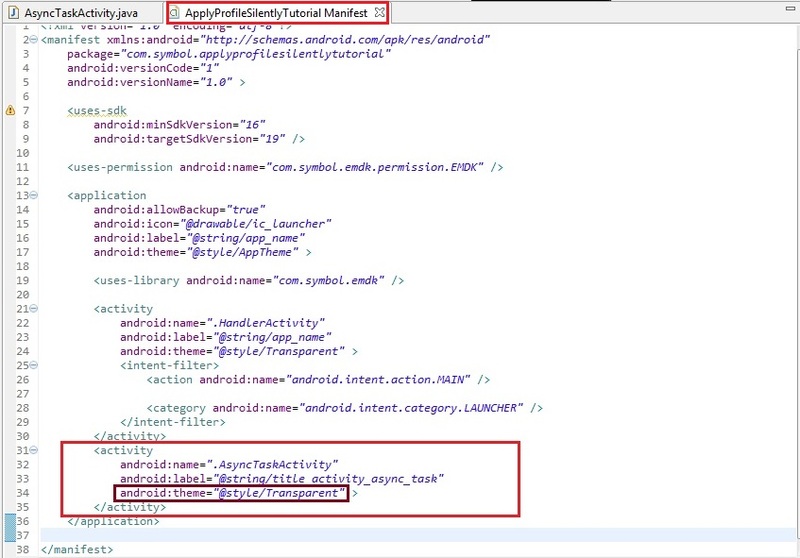 Moreover, the operation of applying EMDK profile configuration to device takes place on the UI main thread. Depending on the Mx feature and complexity, it takes few seconds to apply configurations to the Symbol device. So the application's UI thread is blocked for these few seconds and user cannot interact with application's UI within that time period. Even if the user tries to interact with application's UI, the application does not respond showing "Application Not Responding" (ANR) message asking user to wait. 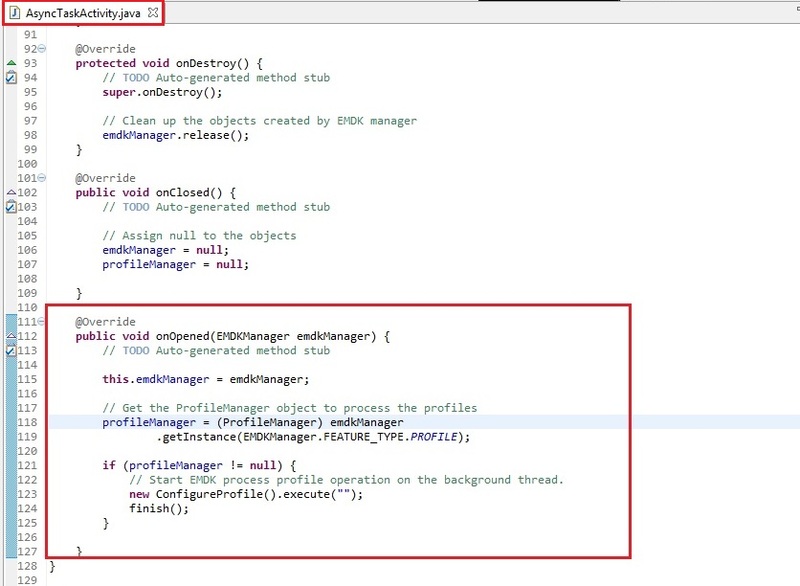 Applying EMDK configurations is a heavy process to be performed on the main thread. The main thread has to manage UI components primarily. Hence if two heavy functionalities happen on a single main thread, it will delay response to the user actions, which may irritate user and hence stop your process, displaying "ANR". Solution: In Android, it is recommended to run only UI components on the main thread. Any other operation should always be run on a different background thread without blocking the UI main thread and completing the operation smoothly without any interruptions such as ANR. A Handler allows you to send and process Message and Runnable objects associated with a thread's MessageQueue. Each Handler instance is associated with a single thread and that thread's message queue. There are two main uses for a Handler: (1) to schedule messages and runnables to be executed as some point in the future; and (2) to enqueue an action to be performed on a different thread than your own. If you are doing multiple repeated tasks, for example downloading multiple images which are to be displayed in ImageViews (like downloading thumbnails) upon download, use a task queue with Handler. When a process is created for your application, its main thread is dedicated to running a message queue that takes care of managing the top-level application objects (activities, broadcast receivers, etc) and any windows they create. You can create your own threads, and communicate back with the main application thread through a Handler. AsyncTask is designed to be a helper class around Thread and Handler and does not constitute a generic threading framework. Since configuration of any Mx feature requires only a few seconds, we can go with any of the two solutions. In this tutorial, we will configure Mx Profile using both Handler and AsyncTask by creating dedicated Activity for each. So far we know how to configure Profile in a Non-Blocking way. Sometimes we don't need User Interface while configuring an Mx profile. Hence, We used the word "Silently" to indicate that there won't be any User Interface in this tutorial. Although, we need UI thread to trigger Mx configuration on the background thread. So we will launch the application and quickly close it after triggering Mx configuration on the background thread. Even if you have User Interface in your application, you can interact with it as UI will not be blocked, because the profile will be applied on a background thread. Note: We are closing the application immediately because we are not notifying user with any UI as well as the configuration is an independent process that we are just triggering from our application and does not require UI. So let us create a tutorial and Configure the Mx App Manager Profile to install an application silently in a Non-Blocking way. Once downloaded, copy the APK file to SD Card of the device. Note: Provide "ApplyProfileSilentlyTutorial" as the project name for this tutorial and "HandlerActivity" as the activity name while creating the project. 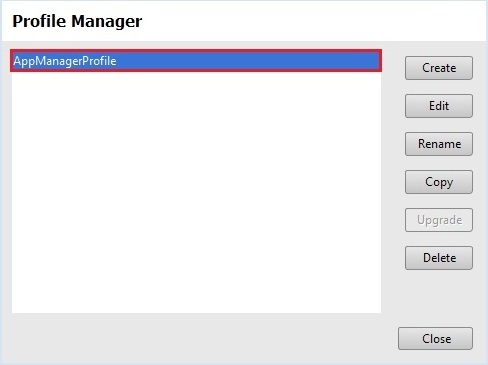 Provide "AppManagerProfile" as the Profile Name for this tutorial. Now, you can see all these MX features on the left hand side of the Profile Editor window. We want to install the downloaded APK file that is residing in the device's SD Card using App Manager. So select the "App Manager" feature from the list and click "Right Arrow". Provide some Name in the "Name" field to modify this feature programmatically (Ex. MyAppManager). Note: You can also keep the "Name" field empty. Since we want to install an application, keep the Action in drop-down as "Install". 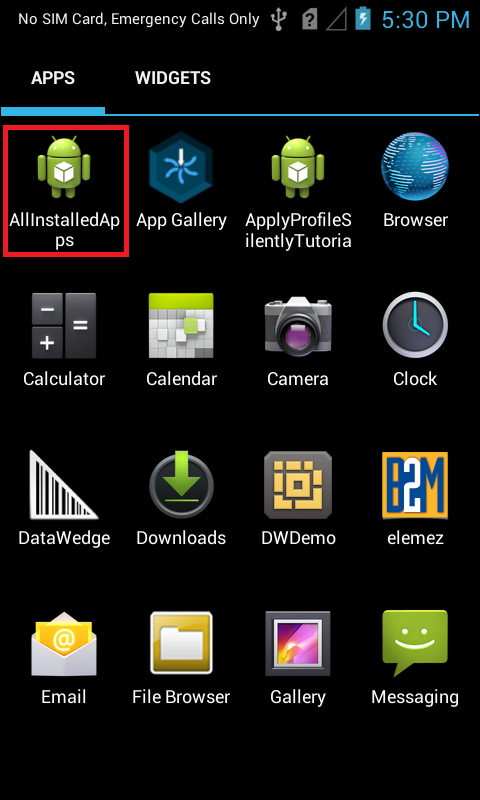 Provide the path and name of the Android application APK file within the device file system (Ex. /storage/sdcard1/AllInstalledApps.apk). Click Finish and your App Manager profile for installing an application is created. Now we will start to add some code in the "HandlerActivity" that we created to apply the App Manager profile to the device on a background thread in a Non-Blocking way using Handler. We will see how to apply this profile silently without UI later in this tutorial. We will now create some global variables to hold the profile name as well as instance objects of EMDKManager and ProfileManager. These variables would be used throughout the code. Since we don't want any UI in this application, remove the line setContentView(R.layout.activity_handler); from the onCreate method. 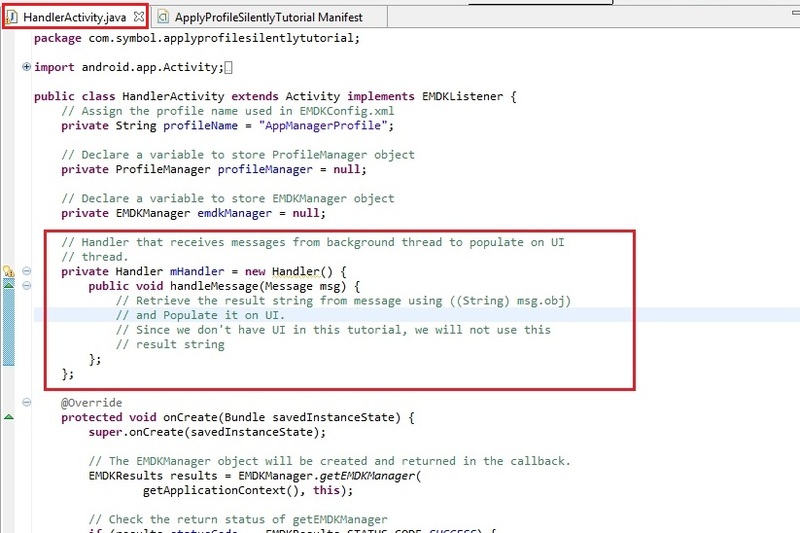 Create a Runnable instance in onOpened method, which will perform App Manager's install configuration on background thread. Ignore the errors for the time being. 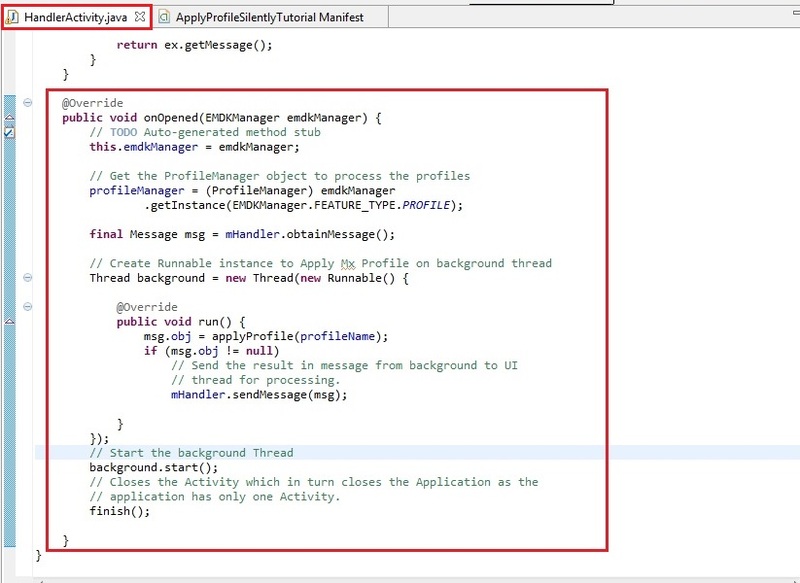 You can see, the background thread calls applyProfile method that applies the Mx App Manager profile configuration to the device on background thread we created. 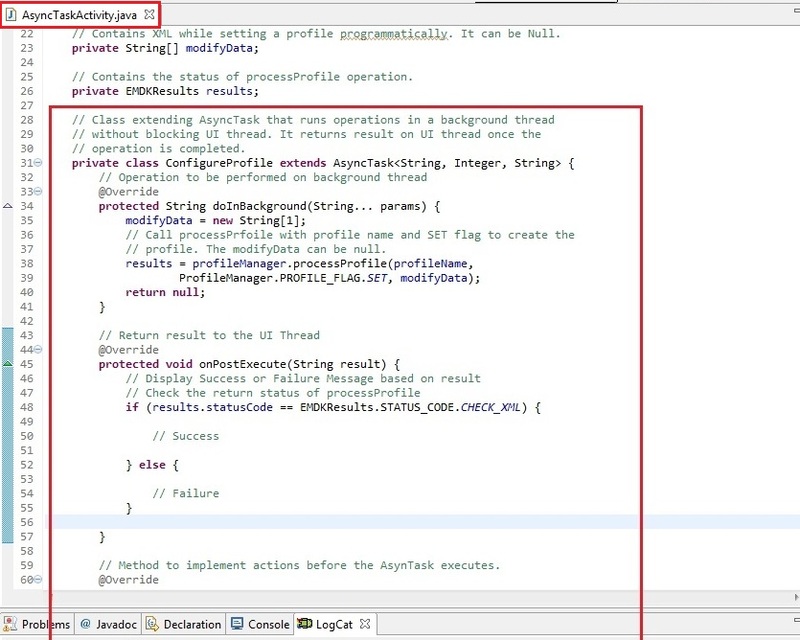 The parameter msg.obj contains result of the background thread operation that we need to pass on UI thread. Hence we will create a Handler in next step and pass the result parameter in Handler in a Message using msg.obj. Since we don't want any UI for this application, we will call the finish() method after sending message to Handler. This will immediately close the application as soon as applyProfile method is triggered on the background thread through Runnable. // application has only one Activity. Create a Handler and retrieve the Result parameter from the Message by type casting msg.obj to String in handleMessage method of Handler. // and Populate it on UI. 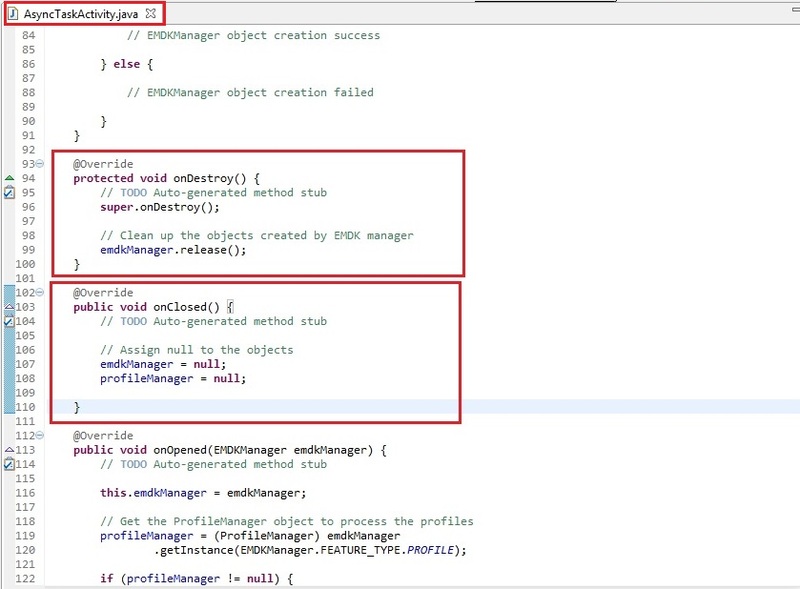 As you can see the handleMessage contains the Message parameter we passed from background thread. The handleMessage method can retrieve the String result parameter from Message by typecasting msg.obj to String using ((String) msg.obj). Now the user can display this result parameter on the main thread. Note: We will not be using this result parameter as we don't have UI in this tutorial. But it could be helpful to display result for the applications that have UI. 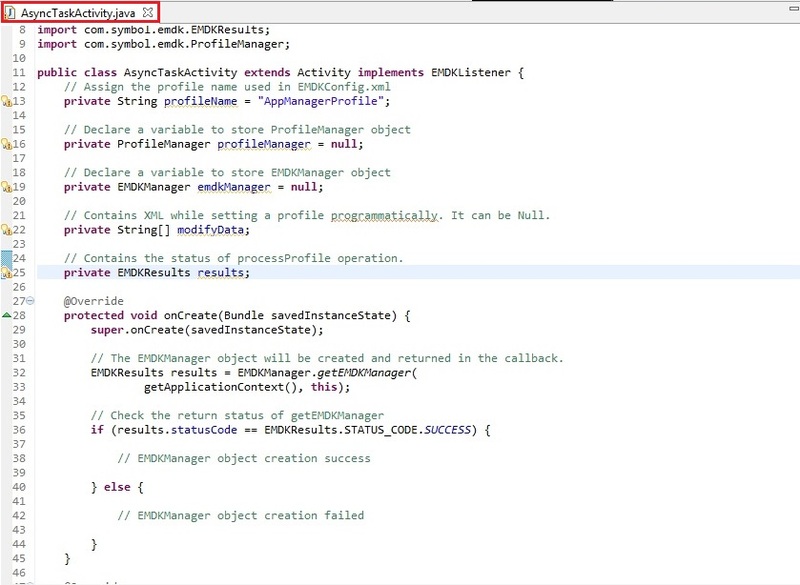 Now that we have a reference to ProfleManager, we use it to install and activate the profile we built earlier. This is done using the processProfile method. We will now create a method that will use processProfile to apply the App Manager profile that we created using EMDK Wizard (Ex. "applyProfile"). 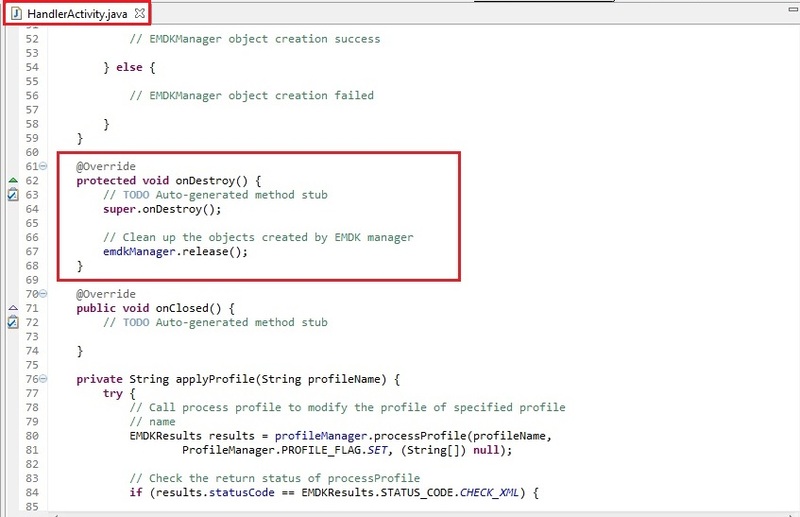 Assign Null to EMDK objects in the "onClosed" method. So far we have done with the coding that will use Runnable and Handler to apply App Manager's install configuration on background thread. It will also close the application immediately using finish() method once background thread starts its execution to apply configurations silently. But the app will still be visible to the user for that small period of time (few milliseconds) before it is closed. We want to avoid UI as it may not require for many Mx configurations. So We will make the UI invisible (basically transparent) for those few milliseconds by applying Android Styles to the HandlerActivity. Before applying, we need to create a custom style that will make the UI transparent. So go to res -> values -> styles.xml of "ApplyProfileSilentlyTutorial" tutorial and write following Android style in <resources> tag that will make background transparent. We will now include this style in HandlerActivity to make it transparent. 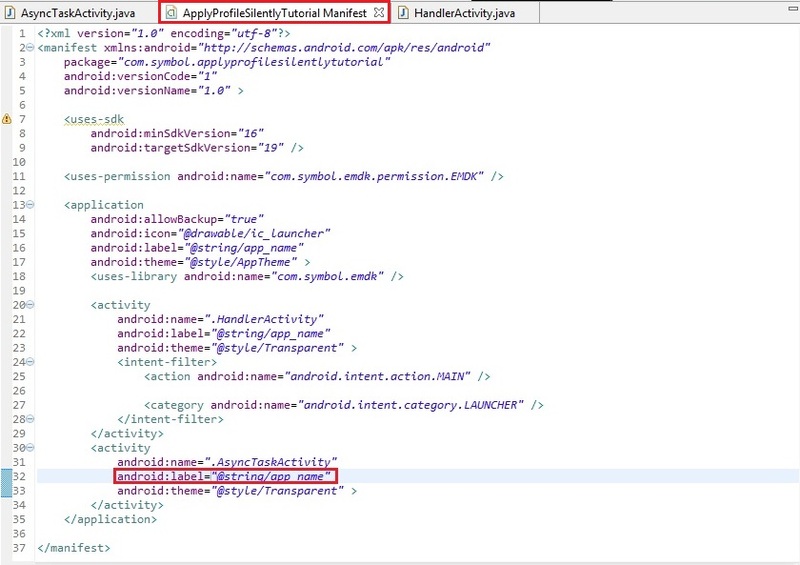 So go to AndroidManifest.xml and add the following code in the <activity> tag for "HandlerActivity". This will apply the styles to "HandlerActivity" and make it transparent for those few milliseconds when this Activity is displayed to the user, which will resolve the purpose of calling it Applying Profile Silently. 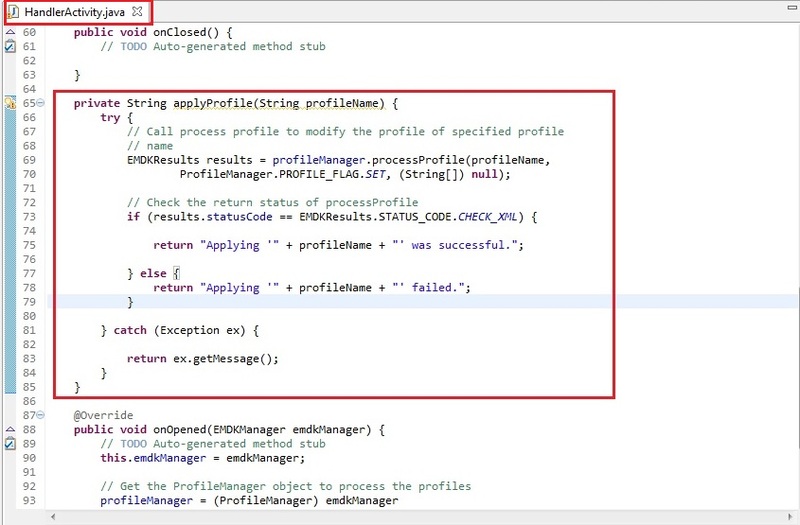 This completes coding and configuration part that will allow us to apply App Manager's install configuration silently in a Non-Blocking way using Handler. If you want, you can run the Application now to test but we are now going to see how the same thing is done using our second option AsyncTask. We will create another activity (Ex. AsyncTaskActivity) and apply App Manager's install configuration silently in a Non-Blocking way using AsyncTask. Select the project and add a new Empty with name "AsyncTaskActivity". Now we will start to add some code in the "AsyncTaskActivity" that we created to apply App Manager profile to the device on a background thread in a Non-Blocking way using AsyncTask. Applying the profile silently without UI is same as we did for HandlerActivity. Note: We will use the same earlier transparent styles in "AsyncTaskActivity" to make the Activity transparent, which will resolve the purpose of calling it Applying Profile Silently. Follow the step 1 of Adding Some Code using Handlers. Add two more global variables. // Contains XML while setting a profile programmatically. It can be Null. // Contains the status of processProfile operation. We will now create an inner class named "ConfigureProfile" in "AsyncTaskActivity" that will extend AsyncTask. AsyncTask will run the operation on a background thread without blocking UI thread. It can also return the processing result on UI thread if you want. The doInBackground method applies the App Manager's install configurations on background thread using processProfile method. The onPostExecute is used to return the result back to the UI thread when the operation on background thread is done. Note: We won't return any result on UI thread as we want to apply profile silently in this tutorial. 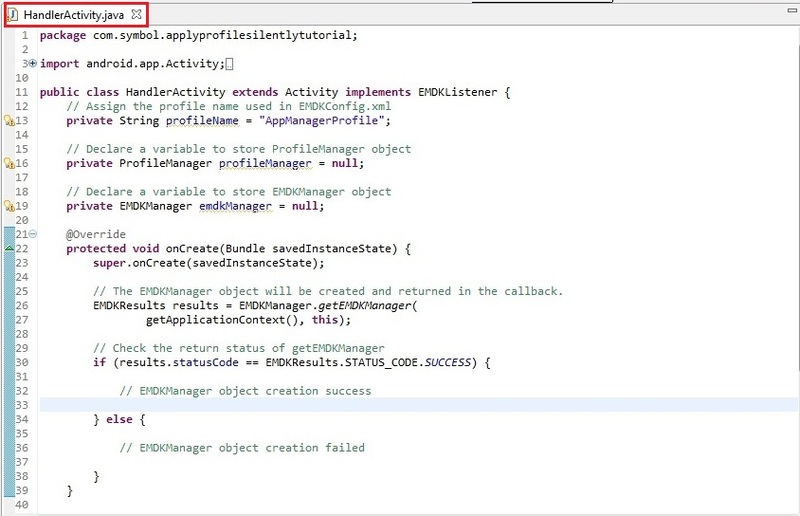 Once the EMDK is ready, we will get the ProfileManager object to process the profile in onOpened method. After that we will execute the AsyncTask that by creating instance of it and calling execute method. This will start the process of applying profile on background thread. Since we don't want any UI for this application, we will call the finish() method immediately to close the application, once the AsyncTask starts executing on background thread. // Start EMDK process profile operation on the background thread. We will now write onDestroy and onClosed methods by adding the same code that we added in the Handler Activity. But the app will still be visible to the user for small period of time (few milliseconds) before it is closed similar to the case of Handler. We want to avoid UI as it may not require for many Mx configurations. So We will make the UI invisible (basically transparent) for those few milliseconds by applying Android Styles to the AsyncTaskActivity. We have already created a transparent style earlier in this tutorial while applying profile using Handler. We will now simply include that style in "AsyncTaskActivity" to make it transparent. 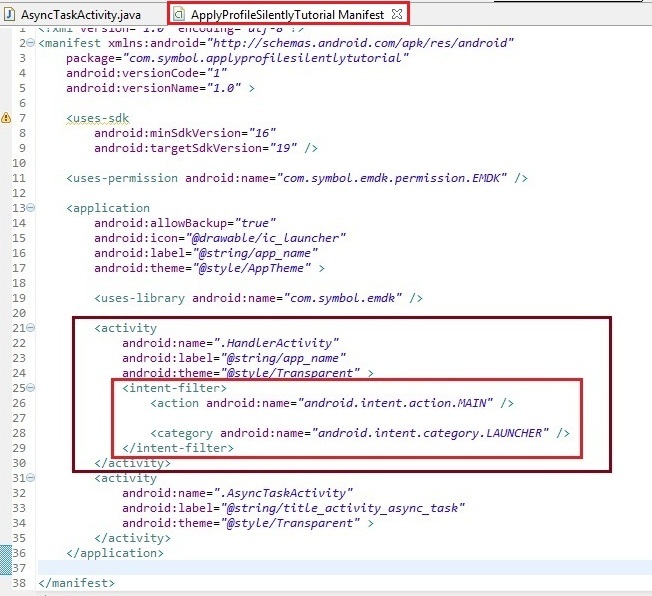 So go to AndroidManifest.xml and add the following code in the <activity> tag for "AsyncTaskActivity". This will apply the styles to "AsyncTaskActivity" and make it transparent for those few milliseconds when this Activity is displayed to the user, which will resolve the purpose of calling it Applying Profile Silently. 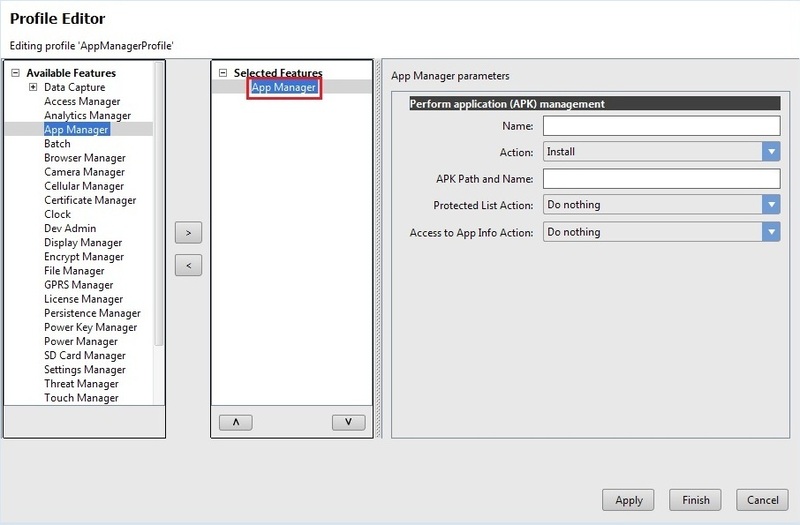 This completes coding and configuration part that will allow us to apply App Manager's install configuration silently in a Non-Blocking way using AsyncTask. So far, We have created two different activities that perform the same operation of applying App Manager's install configuration silently in a Non-Blocking way, but using two different ways viz. Handler and AsyncTask respectively. Now, Let us run the application. Connect the Symbol device (having the latest EMDK runtime) to USB port. 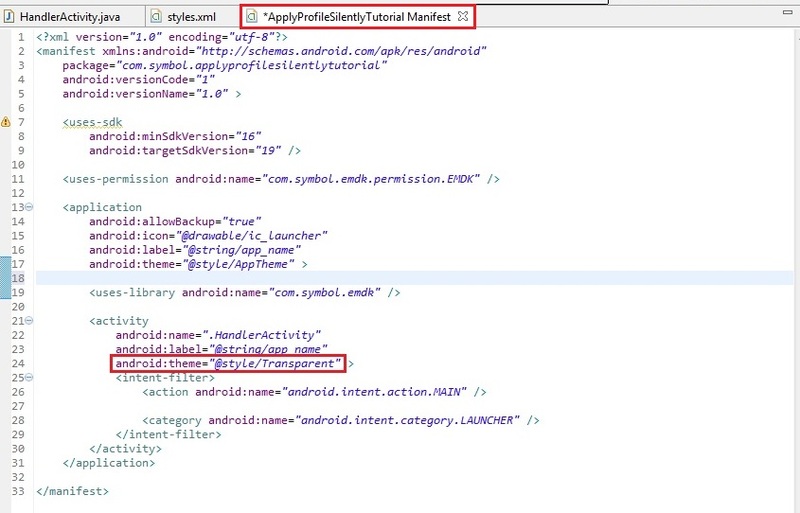 Before running the application, change the lable name to application name for "AsyncTaskActivity" in the <activity> tag of AndroidManifest.xml" file by using following code. Note: It is not necessary to change the label name. But if we don't change, it will display the "AsyncTaskActivity" name instead of application name in the device's applications grid, when we run the application using AsyncTask. 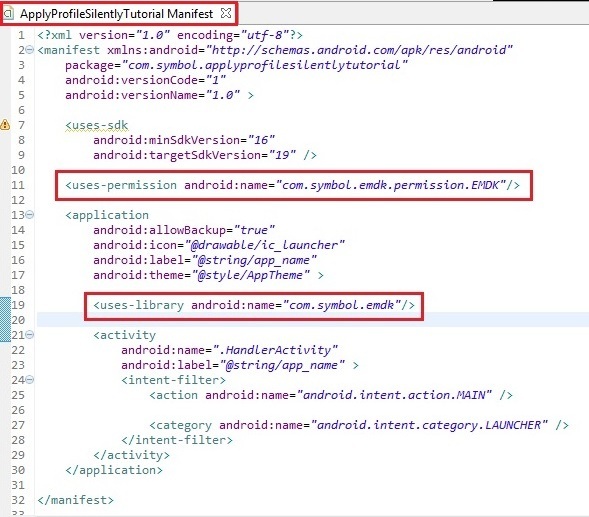 Now when we run the application, it will launch "HandlerActivity" because currently that is the Launcher Activity in "AndroidManifest.xml" file. Note: Make sure that "AllInstalledApps" is not installed on the device before running the app, else the install feature will give error. Run the application (Uses Handler). You will not see any User Interface. 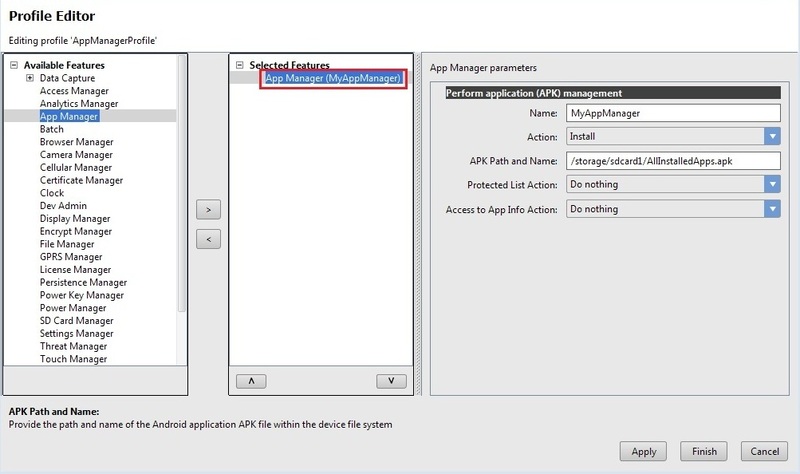 The application applied the App Manager's install configuration on background thread silently using Handler and installed the "AllInstalledApps" application whose APK we had provided in the wizard. Now we will run the application using AsyncTask. We need to set "AsyncTaskActivity" as the Launcher Activity to start the application with "AsyncTaskActivity". 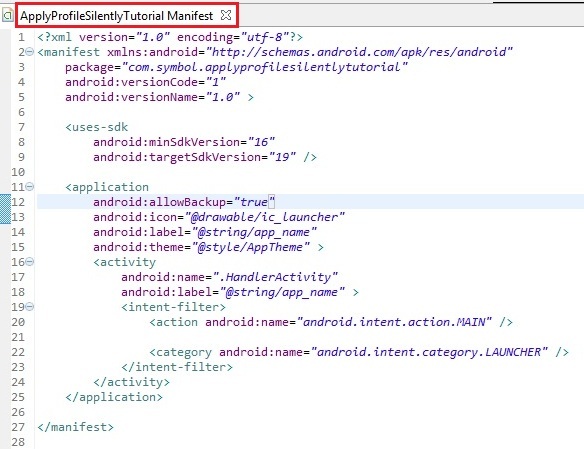 So remove the "Intent-Filter" code from "HandlerActivity" and add to the "AsyncTaskActivity" in the "AndroidManifest.xml" file. Before running the application using "AsyncTask", uninstall the "AllInstalledApps" application that we installed using Handler just now. Run the application (Uses AsyncTask). You will not see any User Interface. 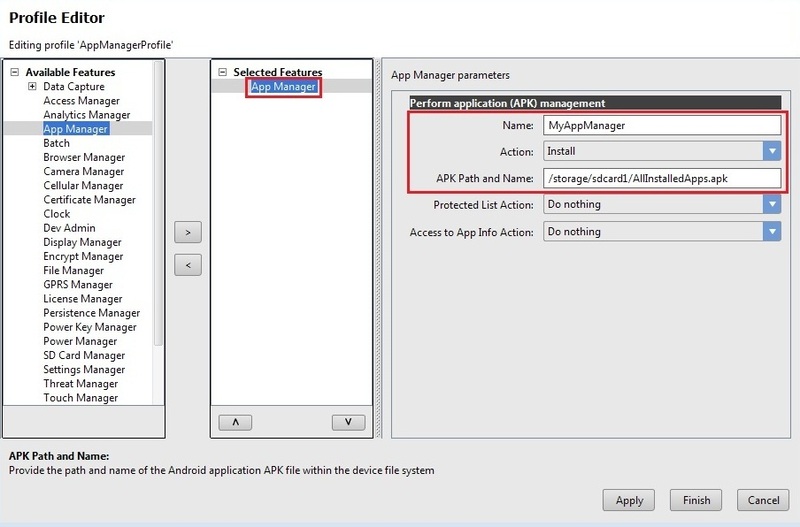 The application applied the App Manager's install configuration on background thread silently using AsyncTask and installed the "AllInstalledApps" application whose APK we had provided in the wizard. Note: While running the application using both Handler and AsyncTask, you can interact with the User Interface while profile settings are being applied on background thread. It won't hang the User Interface this time. 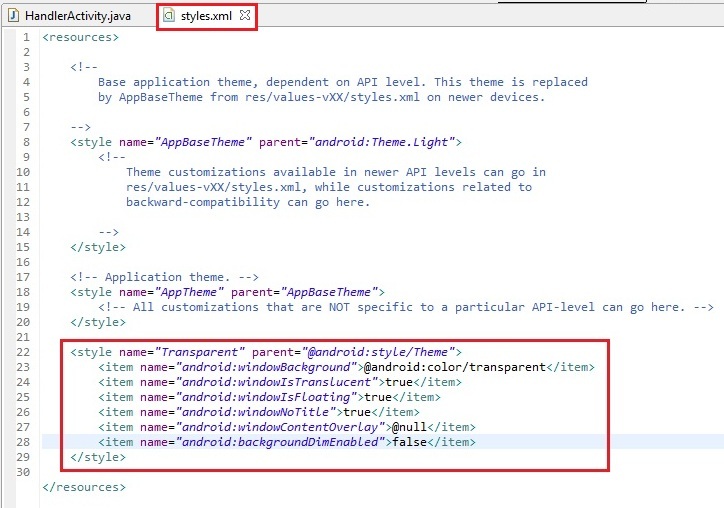 So this is how we can use both Handler and AsyncTask to apply profile settings on background thread in a Non-Blocking way with the help of Android styles to execute it silently without UI. Installing the EMDK for Android application without deploying the EMDK runtime on device will fail because of missing shared library on the device.